There was a day when spring-seeded alfalfa and an oat (or other small grain) companion crop went hand in hand. Though maybe not to the extent of the rotary phone, companion crops are now much less a part of the rural landscape. Ironically, at the same time this trend has occurred, there has also been a movement to utilize more cereal forages in general as a double-crop. The slow but steady demise of the companion crop was primarily brought about by new herbicides that made it possible to obtain good postemergence weed control in alfalfa without severe harvest interval limitations. Products such as Raptor and Pursuit were far superior alternatives to their Butyrac and Buctril predecessors in terms of application timing and harvest restrictions. When Roundup Ready alfalfa varieties hit the market, glyphosate offered an even more convenient and effective weed control option in new alfalfa seedings. It also didn’t come with the internode elongation (stunting) issues that were sometimes evident with Pursuit and Raptor. The second factor that has led to a reduced companion crop use has simply been that dairy farms and their forage storage units have gotten bigger. 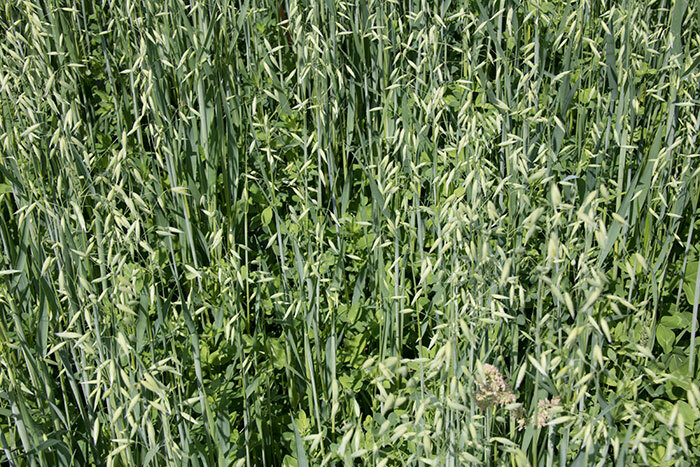 Harvesting pure alfalfa, and more of it, was preferred to dealing with one cutting of an oat companion crop, which had to be stored separately. Most commercial hay growers also preferred not dealing with the small grain companion crop. Both of these reasons for eliminating the companion crop are practical and understandable, but there are times when using a companion crop is the only and/or best option. Seeding a grass species at the same time as alfalfa negates any subsequent herbicide use and often requires the use of a companion crop to help suppress weed growth. Under this scenario, it’s generally recommended to remove the small grain when it reaches the boot stage to reduce competition with the developing alfalfa and grass seedlings. If alfalfa-grass mixtures are desired, but you really don’t want or need the cereal forage, there is a work-around option. Seed a Roundup Ready alfalfa variety and then make a glyphosate application after the alfalfa reaches the appropriate stage (three to five trifoliolate leaves). Soon after, interseed the desired grass species into the stand using a no-till drill. Next, hope for adequate rainfall. Highly erodible fields also provide situations where a companion crop is beneficial for helping to hold soil in place during the early establishment phases of the alfalfa. Again, harvest the small grain at or near the boot stage. If you really don’t need or want the cereal forage but have erosion-prone fields, another option is to kill the oats when they reach 4 to 6 inches with a postemergence grass herbicide like sethoxydim or glyphosate if a Roundup Ready alfalfa variety was seeded. This approach provides erosion control benefits but also allows for more alfalfa yield during the seeding year. A third scenario where companion crops may prove beneficial is on fields with heavier soils that tend to hold water. In this case, the companion crop is helpful in using some of the excess soil moisture, providing improved soil conditions for the developing alfalfa seedlings. The companion crop also can help reduce soil crusting in clay-based soils. Finally, if there is a short-term forage need, growing a companion crop will get you the most forage yield in the shortest amount of time; though the total-season yield of pure alfalfa will be reduced. There is no one size fits all for the companion crop decision. Good reasons exist for not using one, and equally good reasons can be made for using a companion crop under certain situations. The greatest risk to using a companion crop is not being able to get the cereal harvested before or soon after the first seedheads emerge. A cereal grain that is left in the field too long will be lower in forage quality and can do nothing but harm to the new alfalfa stand, which ultimately is your “money” crop.